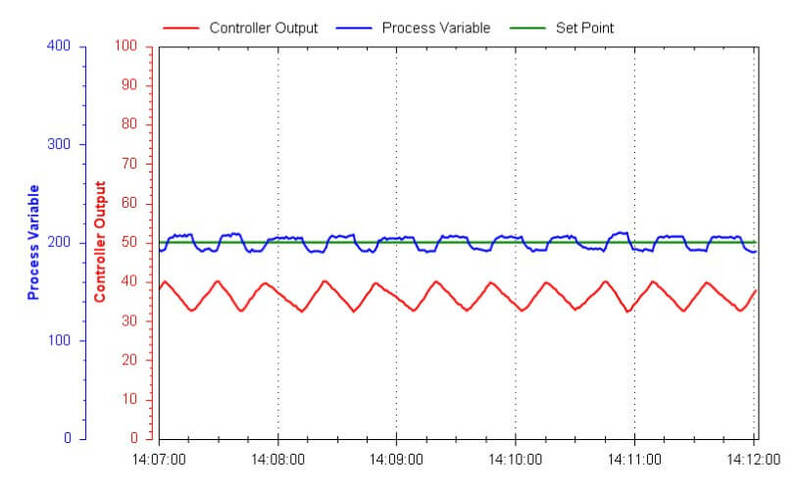 This article provides PID controller loop tuning conditions for different conditions to analyze Process Variable, Set Point and Controller Output trends. This is a closed-loop test, based on the fact the output signal responds dynamically to the changing process variable, as well as to the step-change in setpoint. 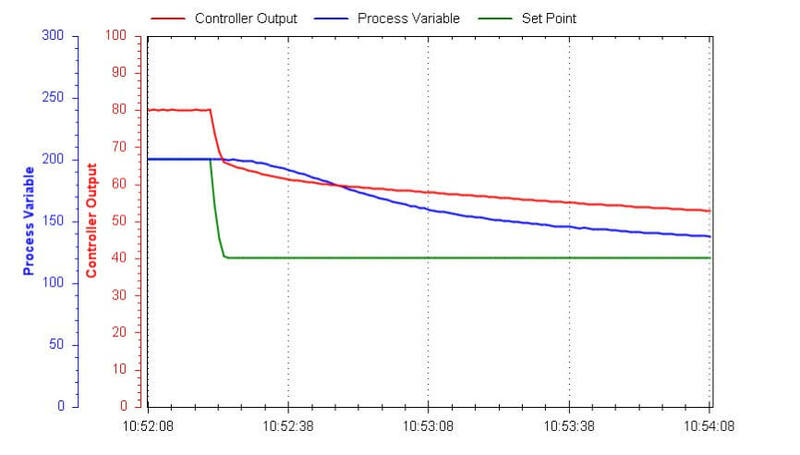 This is a reverse-acting controller: the output steps up when the setpoint steps up (implying the output would step down if the process variable stepped up). There do not appear to be any field instrumentation problems revealed in this trend. A manual-mode (open-loop) test would be more informative in that regard, but it appears as though the process is very quick to respond with no discernable dead time or other lags. The controller tuning is clearly inappropriate for this process. Note the large offset between PV and SP (i.e. how the process variable never settles at the setpoint value, even though it’s clearly a fast-responding process). This tells us the controller is configured only for proportional action, and this process needs integral! We can also tell this from the 180 Deg phase shift between PV and output during the oscillations: this is the classic response of a reverse-acting proportional-only controller with excessive gain. Aggressive integral action with a minimum of proportional gain should work very well in this process, which is probably a liquid flow-control process. 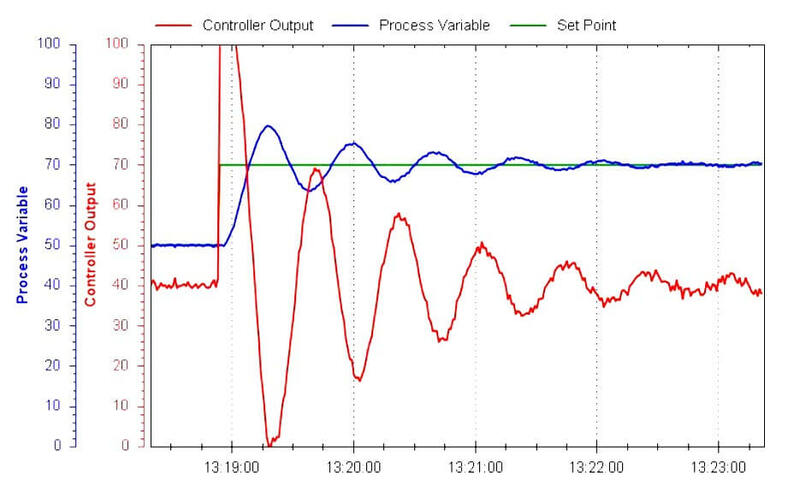 This is a closed-loop (automatic-mode) response, seeing how the output reacts to the changes in setpoint and process variable. The control action here is definitely reverse. We can tell this by examining the output’s immediate down-step as the setpoint is decreased, as well as the output’s decrease as the process variable rises later on. 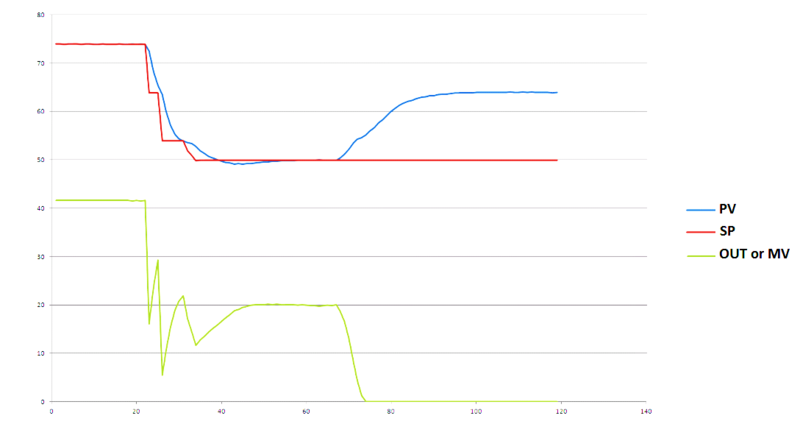 The control system’s initial response to the large setpoint changes looks very good. No problems, either with the field instruments or the controller itself, are evident from this portion of the trend recording. However, something strange happens around the “75” time index, where the process variable begins to rise and the controller output falls to zero in response. It would appear that something has happened to cause the process variable to rise uncontrollably, and the controller is helpless to correct the situation. We may speculate as to the cause of this uncontrollable situation, but there is not enough information to make a definitive judgment. One possible cause is a large load change in the process that overwhelms the controller. Another possible cause is a final control element failure, going to the 100% condition as if the controller signal had increased to saturation. The controller tuning is too heavy on proportional action. We can tell this from the phase shift between PV and output during the oscillations, which is nearly 180o . Excessive integral action would shift the phase of the output wave further to the right (i.e. so that each peak of the output waveform coincided with the zero-crossing of the PV waveform, or very nearly). The fact that the inverse peaks of the PV and output waves are very nearly aligned tells us that excessive gain (proportional action) is the culprit here. Another clue is the magnification of noise we see in the output trend compared to the PV trend – only proportional action or derivative action can cause this, and since we see no sign of excessive derivative action (e.g. 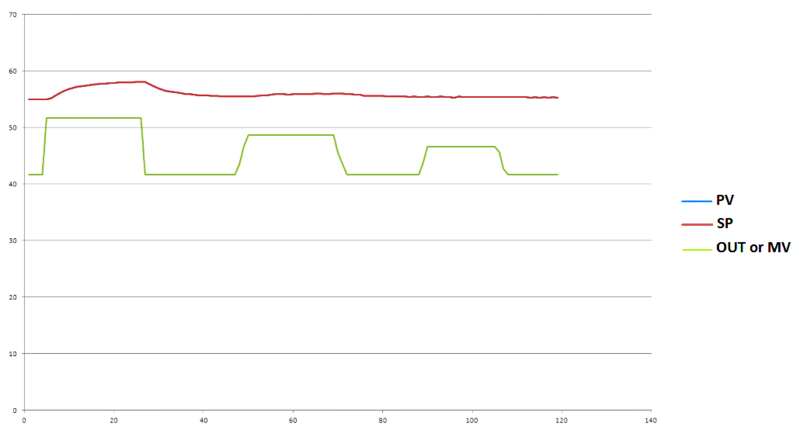 output wave leading the PV wave), we can safely say the problem is too much gain. The process response time (dead time, lag time) seems to be very short, which is a good thing for process control. We can tell, however, that this is an integrating process by the way it was able to achieve a new SP value with the old output value. This means it will exhibit some overshoot with SP changes if there is any integral action. We may have to do most of the control through proportional action (albeit much less gain than we are using now! ), with just enough integral action to handle load changes. This is an open-loop (manual-mode) response, seeing how the output is being moved up and down in step-change fashion which suggests a human operator making changes in manual. The process variable, by comparison, is responding in a smooth-changing manner to those output step-changes. The process variable is increasing as the output signal is made to increase. This tells us the control action in automatic mode will need to be reverse. Put in other terms, if we know the process variable is driven by the output signal in direct fashion (i.e. increasing the output makes the process variable increase, and vice-versa), then we know the controller is going to have to do the opposite to regulate this process. 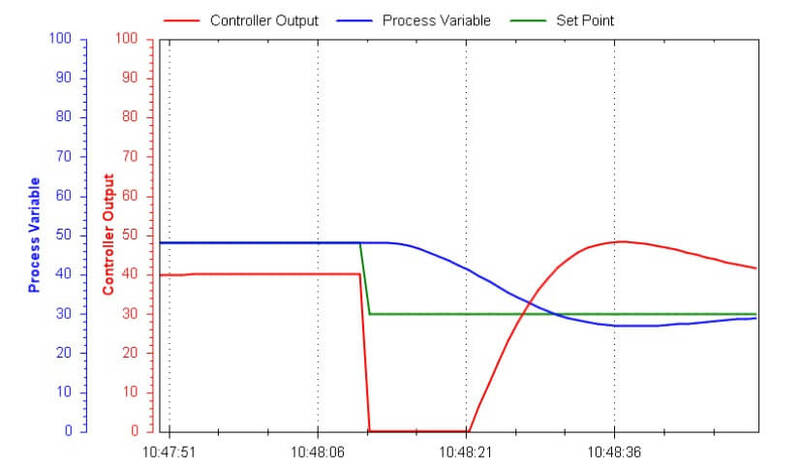 For example, if the process variable happens to increase due to a load change, the controller’s output will need to decrease in order to drive that process variable back down where it belongs. 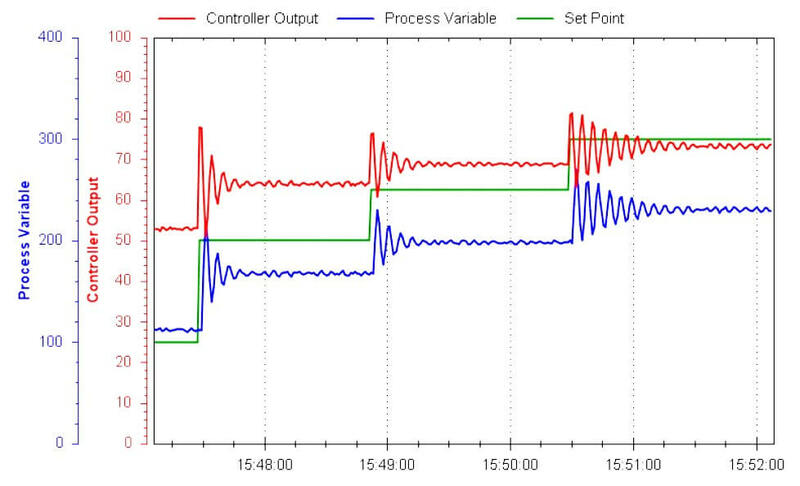 We can tell there is definitely a significant amount of hysteresis in the final control element because the process variable fails to respond to the last (smallest) step-change in controller output. This, incidentally, is a good way to test for hysteresis: step the output up and down in progressively smaller increments until no response is seen in the process variable. It is at that point you may interpret that last output step-change as the amount of hysteresis in the final control element. In this case, that quantity appears to be about 5%. Since this is an open-loop test we cannot tell how well the controller is tuned. However, we can discern from the response of the process variable to output step-changes that this is a self-regulating process with little dead time and first-order lag characteristics, which means it should respond well to fairly aggressive proportional action and will also require integral action to avoid offset. This process does exhibit some dead time as well as lag time, which explains the setpoint overshoot. A field check of the control element (valve) might be good to do, so see that it is not sticking and causing dead time. The controller tuning actually looks pretty good here. The only problem is the slight overshoot of setpoint, which may or may not be significant depending on the specific process and the needs of operations personnel. If this overshoot is deemed excessive, we might wish to turn down the proportional action (gain), based on the fact the PV and output waves seem to hit their respective peaks at nearly the same time (characteristic of proportional-dominant action). Given the existence of dead time and lag time together, we must be careful not to use too much proportional action lest the loop oscillate. Derivative action could be very useful in taming the effects of lag time. There do not appear to be any field instrumentation problems revealed in this trend. A manual-mode (open-loop) test would be more informative in that regard, and it appears as though the process possesses a multiple-order lag, but the time scale of this lag seems modest. It might not be a bad idea to look around for sources of lag time (e.g. thermowell mass, improperly inserted temperature probe), just to see if the response time might be improved a bit. Another possibility explaining the lag time would be a transmitter (or controller input block) configured with too much filtering (damping), adding a single-order lag to whatever lag(s) the process itself already possesses. The controller tuning is clearly inappropriate for this process, and should be much more aggressive than it is right now. Note how the PV is taking a long time to reach the new SP, and how the controller output is ramping down at a very leisurely pace. This process appears to be self-regulating, and so we know we must have some integral action in the controller. The existence of multiple-order lag makes this loop a good candidate for moderate derivative action. This is a reverse-acting controller: the output ramps up whenever the PV is below SP, and the output ramps down whenever the PV is above SP. This loop definitely has hysteresis in the final control element (e.g. sticky valve), because this trend is a classic slip-stick cycle in a self-regulating process: the PV exhibits a square-wave shape while the output ramps up and down like a sawtooth wave. There probably isn’t anything wrong with the controller’s tuning, and no tuning adjustments will fundamentally address the problem of valve stiction. The process appears to be self-regulating with a fast response time (note how quickly the PV settles at a new value following each “slip” of the control valve), which means it should control very well with aggressive integral action. However, final control element hysteresis is the bane of integral action, as it causes repeated reset windup as we see here.